Each Relax Wrap can do 3 helpful things. based on what will help most at the time. You have experienced Deep Pressure Therapy before! Every time you get a good hug, you are getting Deep Pressure Therapy. Applying gentle, distributed weight to your body does lots of cool things. It fires a bunch of happy chemicals in your brain. These happy chemicals make you feel calm. They give you a sense of well-being. This effect is called Deep Pressure Stimulation. With a Relax Wrap, you don't have to wait for the next great hug to come along. 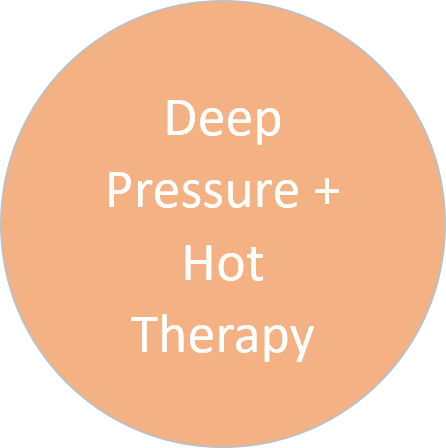 You can get Deep Pressure Therapy any time you want! Note: Deep Pressure is painless. Don't think of someone digging their knuckle deep into your muscle until you are in pain! Deep Pressure actually encourages muscles to relax softly and gently. When should I use Deep Pressure Therapy? When should I use Deep Pressure + Hot Therapy? 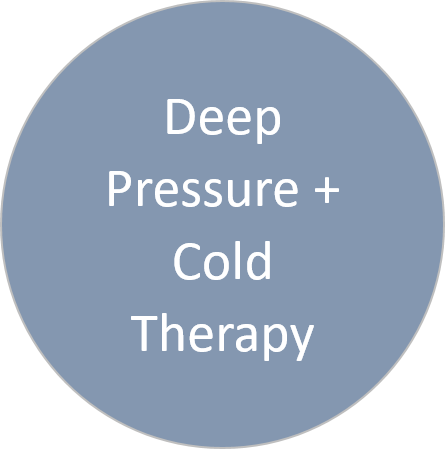 When should I use Deep Pressure + Cold Therapy? want to wake up, or are feeling groggy. That cold sensation will wake you up! What are some other benefits of using a Relax Wrap? It may be used as often as needed. If emotional or physical pain causes problems every day throughout the day, you can use it over and over. It can be used as a supplement to your current regimen. You can use your wrap on top of what you are already doing to deal with your stress and pain to feel even better! It is versatile, easily going from hot to cold or just used for deep pressure therapy, like a hug. It is made by hand, so you can feel the love we put into making your wrap.